Vince Cable has waded into the debate about whether a heavily pregnant MP should have been offered a seat by colleagues in the Commons. Jo Swinson, who is seven months pregnant, stood next to other MPs for half an hour at Prime Minster's Questions on Wednesday. The Lib Dem equalities minister has said she wanted to stand. But that has not stopped Mr Cable and others calling for a return to more chivalrous behaviour. The business secretary said: "I didn't see the incident. "But I think as a matter of basic consideration and good manners people should offer their seat to someone who's visibly pregnant. I'd have thought that was just automatic. "The old tradition of men offering seats to women has long gone but I think if somebody is heavily pregnant or is disabled, basic decency suggests you should give them preference." Ms Swinson, a junior minister at Mr Cable's business department, has declined interview requests about the matter, which was sparked by Twitter comments on Wednesday, after she had been spotted standing in the Commons chamber. Writing on Twitter on Thursday, she joked: "About to get on the Tube - seat offers welcome & definitely not sexist :o) But I was happier standing at pmqs yesterday." Ms Swinson, who represents East Dunbartonshire, is married to fellow Lib Dem MP Duncan Hames. The Spectator magazine's political editor James Forsyth caused a flurry of comments when he tweeted about Ms Swinson on Wednesday. "Quite remarkable that no MP has offered Jo Swinson, who is seven months pregnant, a seat. Really shocking lack of manners and decency," said Mr Forsyth. According to the Daily Mail, a source close to Ms Swinson said the suggestion that she had been unable to "fend for herself" was "quite sexist". But David Cameron appeared to disagree with this view. Asked if the prime minister would offer a pregnant woman a seat if he were to find himself on a bus, his official spokesman said: "I'm sure he would. "If we take the example of public transport, if you see someone who is in greater need of a seat than yourself, then offering that seat is the right thing to do," he said. Ms Swinson's child, her first, is due on Christmas Day, according to reports. 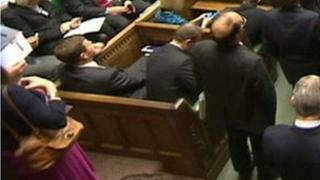 The MP did manage to find a seat on the government front bench later on Wednesday, when most MPs had left the chamber.